← How Does a Water Softener Turn Hard Water into Soft Water? You likely know that hard water can cause limescale buildup, which in turn leads to poor plumbing performance, plumbing repairs, and increased energy bills. But did you know that hard water can have several negative effects on your body too? Not only can hard water cause changes in your skin, like dryness and itchiness, it can also change the way your hair looks, feels, and behaves. Continue reading to learn how hard water can damage your hair, as well as, how to resolve a hard water problem in order to protect all aspects of your well-being. It helps to understand what hard water is before learning how it can affect hair. Hard water is water that contains higher traces of hard mineral content, namely iron, calcium, and magnesium. These hard mineral ions are accumulated when rain water trickles down through the earth’s soil and rock. And although our municipal water companies provide state-regulated water purification for our towns, there is still a nominal amount of hard mineral ions in tap water. Fortunately, there are plenty of methods to reduce or eliminate hard minerals in your tap water. But before we get to these solutions, let’s talk about your hair. Hair is affected by hard water in that it can begin to experience exponential dryness, brittleness, splitting ends, fading color treatments, and even heavy residue buildup. 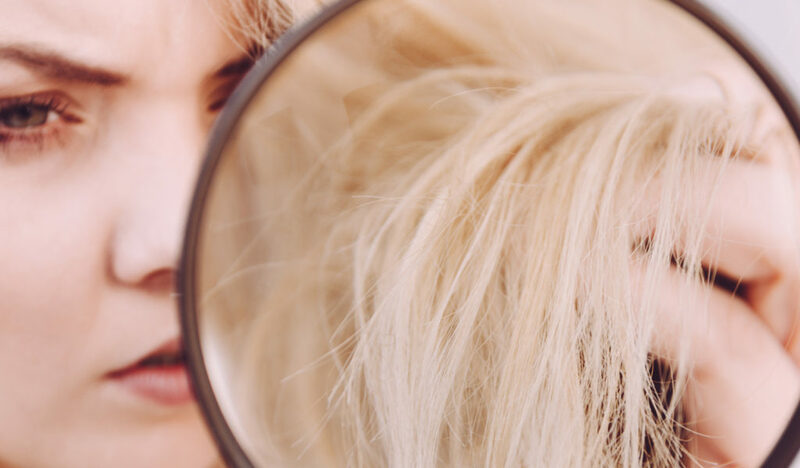 You will quickly notice a difference in the way your hair behaves when you have a hard water problem because every day will start to feel like a “bad hair day.” After a few weeks of dealing with such problems, you may begin to ask yourself why this is happening. You see, hard water does not lather well in water, which also means your showers will feel less adequate and satisfying when scrubbing down. As a result of poor lather aptitude, shampoos and conditioners do not rinse out well either. Unfortunately, most do not realize they have not washed all the shampoo out of their hair because hard water can be quite deceiving. Let’s Get to the Solutions! If you have dry skin, dingy hair, stiff or faded laundry, poor performing water-related appliances, and other tell-tale signs of a hard water problem, your best bet is to purchase a quality water softener. If you already have one, you are definitely in need of some repair or even a replacement. See our blog, “Do I Need a New Water Softener?” to learn how you can tell the difference. If you do not yet own a water softener, you will soon learn that is it one of the most imperative and beneficial appliances you can have in your home. Not only can it prevent costly plumbing breakdowns and lower energy bills, it can also pamper you, enhance your clothing, clean up your dishes, and much more. See our blog, “What are the Benefits of a Water Softener?” to learn exactly how your life can change with a water conditioning system. This entry was posted in Hard Water and tagged hard water and hair problems, hard water facts, hard water hair damage, hard water negative effects, hard water removal Indianapolis, Water Softener Service Indianapolis. Bookmark the permalink.